Inertia is a property of the grid which limits frequency variations in the case of sudden load or generation changes. High penetrations of renewable energy reduce the inherent inertia of the grid. Synthetic inertia can be introduced using smart grid techniques to overcome this problem. The frequency of a power system depends on real power balance: generation vs. demand. In the standard operation of a power system, the frequency is regulated within strict limits by adjusting the electrical supply to meet the demand. If the balance between generation and demand is not reached, the system frequency will change at a rate initially determined by the inertia of the total system. The total system inertia comprises the combined inertia of most of the spinning generation and load connected to the power system . Low levels of rotational inertia in a power system, caused in particular by high shares of inverter-connected renewable energy sources (RES), i.e. wind turbines, and PV panels which normally do not provide any rotational inertia, have implications on the grid’s frequency dynamics. This can lead to situations in which traditional frequency control schemes become too slow with respect to the disturbance dynamics for preventing large frequency deviations and the resulting consequences. Fig. 1: Grid inertial response . The loss of rotational inertia, and its increasing time-variance, leads to new frequency instability phenomena in power systems. Frequency and power system stability may be at risk . If, during a system frequency disturbance, the balance between generation and demand is not maintained, the system’s frequency will change at a rate initially determined by the total system’s inertia (HT). The total system’s inertia comprises the combined inertia of most of the spinning generation and load connected to the power system. The contribution of system inertia of a load or generator is dependent on whether the system frequency causes changes in its rotational speed and, therefore, its kinetic energy. The power associated with this change in kinetic energy is fed by, or taken from, the power system and is known as the “inertial response” . 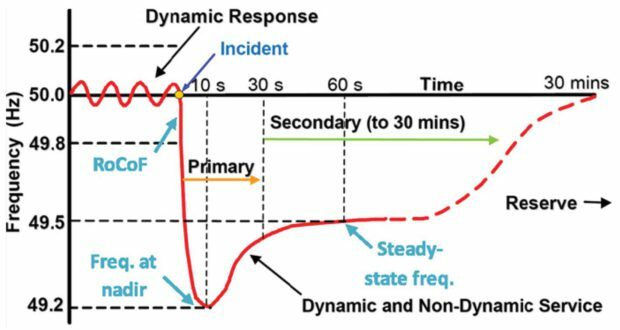 During a system frequency event the total inertial response of all electrical machines connected to the system determines the initial rate of change of frequency (ROCOF). For a robust power system (system frequency is not overly sensitive to power imbalances), it is extremely important that a large proportion of generation and load connected to the power system contributes to the system’s total inertia and then provides inertia response. Fig. 1 shows the typical inertial response requirements of a grid. Inertial power rating and energy will depend on what is required by the network, and is dependent on the level of power to be supplied to the network in the instant between failure and adjustment of remaining plant to take up the load. The main purpose of primary frequency control is to react within a few seconds to any frequency deviation and to re-establish the balance between produced and consumed energy. The activation is done locally and independently by a proportional control in every participating power unit. Secondary frequency control, also referred to as load frequency control (LFC), is the second level for compensating an active power mismatch. It starts after a few seconds and returns to the nominal value within 15 min. If it does not, tertiary control takes over from secondary control. As opposed to primary control, secondary control reacts only to a disturbance in the LFC’s own control area in order not to change the load flows on tie-lines to other areas. It can be either performed manually or automatically. 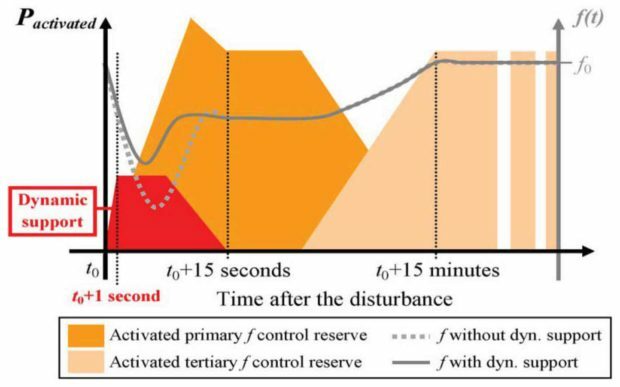 If necessary, tertiary control reserves are manually activated within 15 min by the TSO. It is primarily activated to free secondary reserves in a balanced situation, but also to support secondary control after a large incident to restore the frequency to the nominal value and prevent the need of primary control. Tertiary control reserves have to run until the generation is re-scheduled to fit the new system situation. Wind and solar PV are the most affected. Hydro and biomass all use machines which have inherent mechanical inertia. Future problems may occur with fuel cell generators which do not have mechanical inertia and have limited ability to provide extra power even if sufficient fuel is available to do so. In addition to having low or zero inertia, renewable energy devices also have variable output and may not be in a position to contribute any energy to support the grid during a failure condition. Wind turbines are asynchronous machines and have no inherent inertia. DFIG configurations disconnect the output from the rotating mass so that it cannot be used as an inertial device. Developments by several suppliers have enabled the rotating mass of the blades to be used to create synthetic inertia and feed additional power into the grid to support loss of generation. Latest versions of many wind turbines carry this feature as standard but older machines remain problematic. Wind turbines are variable in nature and may not be able to provide any energy for frequency support during times of low production, and cannot be relied on as a source of frequency support energy. Fig. 2: Storage can be used to supply fast acting primary frequency support . Solar PV panels have no rotating parts and no mechanical inertia, and cannot be used for frequency support either. At the micro-grid level most renewable energy devices will be PV so some additional means must be found for keeping the frequency stable. Many PV systems are overdesigned today, i.e. the DC power available exceeds the AC power output. They also have a very rapid response time. This could be used to bolster the network, depending on the circumstances, but output is limited by the rating of the inverter. The output of PV systems is variable and will not be able to supply any grid frequency support during periods of low radiation or outside daylight hours. Energy storage is a main component of any holistic consideration of smart grids, particularly when incorporating power derived from variable, distributed and renewable energy resources. DESS has the ability to both absorb and supply energy to the grid. Storage systems are seen as an important component of the smart grid and are usually installed with the aim of long-term balancing of supply and demand or load shifting in mind. The smart grid, with its many advanced communications and control features, will make it possible to integrate the widely dispersed energy storage systems. These systems can then be treated as a single huge resource serving multiple applications. Many units today provide both rapid short-term response and slower long-term capabilities, and the potential to use existing and future network storage units for frequency control by introducing synthetic inertia are being considered. The use of DESS as a short term synthetic inertia source has been investigated over a wide part of the industry. Currently, energy storage systems are based on providing primary and long-term support and are not equipped to provide synthetic inertia or dynamic support. In addition, many of the networks with storage installed do not feature communication between all devices in the network, and do not have centralised control of the network. Interconnection and communication between devices is a feature of a smart grid, and this would allow effective use of DESS to provide frequency support. DESS systems which can provide both over- and under-frequency support have been developed . of performing either function when required . While battery energy storage technologies can cover a wide spectrum of applications, ranging from short-time power quality support to hours-long energy management, the supply of primary control reserve has been identified as the application with the highest value for the owner of the BESS . The focus is on short-duration storage technologies which can be used to assist in primary frequency control. Storage technologies that suit such applications, typically grid-scale batteries, can respond at a much faster rate than the mechanical actions of traditional governor controls and blade pitch or wind turbine speed control mechanisms. However, economic concerns suggest that such storage will be very limited in the amount of power it can provide . Requirements for synthetic inertia (power levels) may be several times higher than the nominal supply rate from the storage unit and synthetic inertia discharge capability would have to be included in the output circuit. Energy support for frequency management is short in nature and many solutions are based on super- and ultra-capacitors. Ultra-capacitors are well-suited to supply as such a pulse of power. The reason is obvious: high energy discharge capability and long life. Synthetic inertia generation using ultra-capacitors has been demonstrated successfully on grids such as in island networks , and the extension to micro-grids and larger smart grids using DESS is a distinct possibility which has been considered by numerous networks. Fig. 3: Response of BESS to an under-frequency event . The purpose of DFCS is to take advantage of the short response time, of the order of ms in some cases, of modern DESS to improve the dynamic performance of power systems. Designed for isolated power systems, the systems have been extended to micro-grids and larger smart grid applications. In electrical islands, frequency excursions are sizeable and automatic load shedding is often required in response to disturbances. By injecting active power in the timeframe of hundreds of ms up to a few seconds after the loss of a generating unit, fast-acting storage can support the conventional production assets during the activation of their primary reserve, and with larger DESS units, can provide the primary reserve itself. BESS has been used in conventional networks to provide frequency support. In 2009, a 12 MW, 4 MWh BESS was installed in northern Chile in order to offload some of the reserve obligation of a 277 MW generation station. 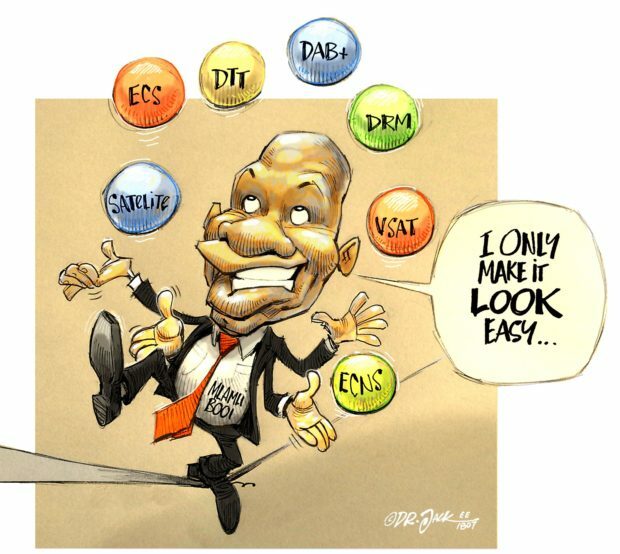 The system, in operation since 2009, operates autonomously using local control and monitoring. ABB: “Energy storage-keeping smart grids in balance”, ABB Energy Storage, 2012. 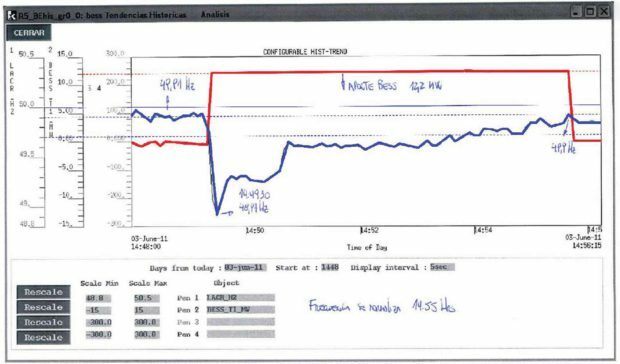 A Oudalov: “Optimising a battery energy storage system for primary frequency control”, IEEE Transactions on Power Systems, Vol. 22, Issue 3, August 2007. E Heish and R Johnson: “Frequency Response from Autonomous Battery Energy Storage”, Grid of the future symposium, Cigré US national committee, 2012.